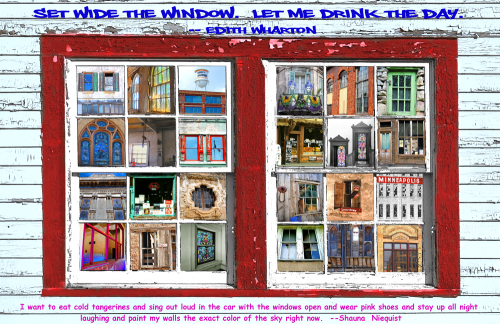 Enamoured by doors and windows, Kathy created this piece to celebrate windows. The window frame and background are from a vintage black and white photo. The photo was restored and colorized. Numerous window photos were then scaled to fit within each window pane and interesting text added to make a one-of-a-kind piece of wall art. Composition by Kathy Weiser-Alexander.